We want to provide you with the correct replacement sanitaryware item, and to do that, we need the right information from you. Please have a look through a guides below, and contact us with your requirements. Close coupled or low level. >Side supply or bottom supply. If close coupled how many bolts fixing cistern to pan. A guide as to the age (if you have only been in the house 10 years it's a help!). Any names or numbers under cistern lid. Indicate type of pan from diagrams. 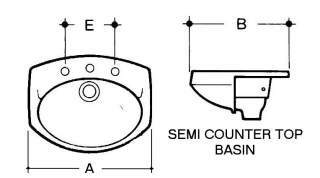 The simplest method of differentiating between washdown and siphonic pans is to estimate the distance between the bottom of the 'U' bend and the floor. In a washdown pan it will be 25mm, and in a siphonic pan it will be 100mm. 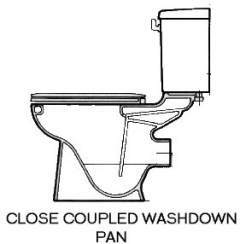 If close coupled how many bolts fixing cistern to pan and how many fixing holes in the pan: 2,4 or 6. 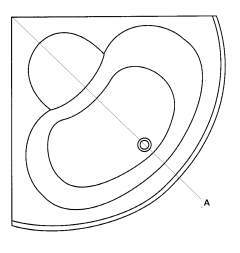 Indicate the pan outlet from the diagrams. If the official sanitaryware colour is not known, the make, age, and a general description of the colour should allow us to narrow down the colour and send some samples for confirmation. The majority of seats are standard and have a standard oval seat with approximately 170mm hinge fixing centres. 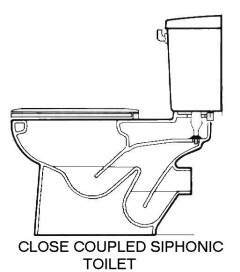 If your seat has wider fixing centres, a very wide back or a more rectangular form, it will be necessary to establish the toilet make/model. 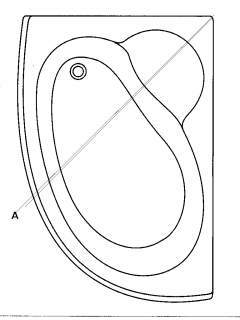 To do this send a photo or template of the seat to us, together with such colour information that you have. An estimate of the items age. 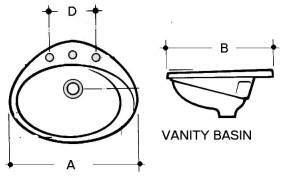 Establish from the diagrams the type of basin to be replaced. 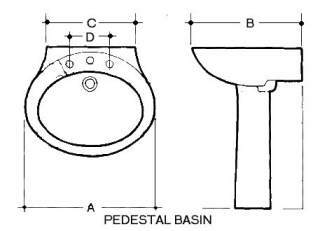 Measure dimensions A, B, C, & D as indicated in the sketch for the basin you require. Note if there are 1, 2, or 3 tapholes. With over 130 colours to identify, many of which are quite similar, the make of the sanitaryware eliminates most of the possible mismatches as each manufacturer produces a limited number of colours. A digital photo of the basin and toilet is always useful as although the exact colour reproduction is not reliable, we can identify the make and an indication of the colour enough to send a few samples for final confirmation. Measure overall length and width. Note that there may be up to 15mm recessed in the wall. Colour of grips : chrome, gold or self coloured. Measure length of both sides along the walls. Measure maximum projection of both sides parallel to walls. >Note if the long side is to the left or right when viewed from point 'A'. Note if taps are to the left or right when viewed from point 'A'. Measure length along the wall. Measure length parallel to wall of greatest projection. Measure from corner to front centre of bath. Standard bath panels measure height and length. End panels should be measured if the bath is over the 700mm standard size. Corner bath panels are not interchangeable, unless the make and model are known or a digital photo supplied it is unlikely we will find a match. Colours: occasionally the colour is stamped on the back of the panel. The best alternative is to investigate the toilet or basin for a make, this and an indication of age should help narrow the possibilities for us to send some colour samples for confirmation. The make ( may be more easily found on associated toilet or basin). 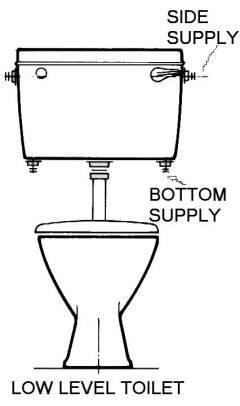 Note the type of bidet from diagrams. Note the number of tap holes; 1, 2 or 3 with central ascending spray. If there are any model names or numbers on a matching toilet they can be useful.